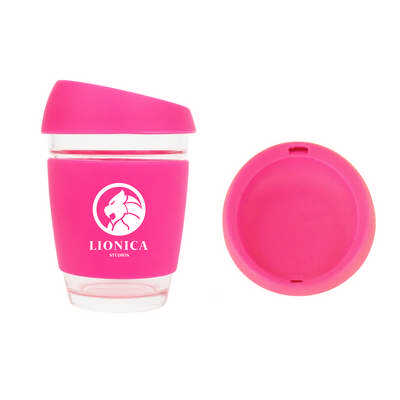 12 OZ Glass Reusable Coffee Cup is made of clear, durable glass, these customised Mugs are perfect to keep you cosy on a cold day. The delightful design and practical features will help you enjoy your best beverages to the max. Savour the flavour for a much longer time with the thermal insulation, and add some personalisation with the printing and etching options. Any of your guests will sure enjoy sipping their favourite coffee or tea and watching their delightful swirls and colours. Its great for restaurants, hotels, coffee shops, and catering services Material - Food Grade Silicone & PP Lead time is from confirmation of artwork approval. Lead time refers to dispatch, final delivery time will depend on location and type of courier used Stock availability: Order fulfillment is dependent on stock availability, and delivery timeframe, of the factories which we work with. Please confirm availability with us before placing your order Colours - Standard colours (MOQ: 100): Mint green, yellow, pink, purple, light grey, lime green, blue, red, grey, Lavender purple, rose pink, Vintage green; Mix & match and PMS Matching services are both available for QTY over 200 Product size - 90(Dia) x 134(H)mm;12 OZ (340ml) Print size - Screen Print: 75(W) x 50(H)mm Sticker: 30 x 30mm. Price includes : 7wk Unbranded. Setup is included.